The Leica X2 compact digital camera, available at 42nd Street Photo in New York City, features an APS-C-format professional CMOS image sensor with over 16.5 megapixels (effective 16.2 MP) and a high-performance Leica Elmarit 24 mm f/2.8 ASPH lens. The X2is an extraordinarily well-built digital camera with a sensitivity as high as 12500 ISO and capable of taking stunning photographs in a variety of conditions. The Leica X2 offers the user the convenience of multiple automatic settings or full manual control. A sophisticated autofocus system is pin drop quiet — perfect for shooting animals in their natural habitat on safari or a bride and groom at their wedding ceremony. The CMOS image sensor has a high resolution of over 16 megapixels. The Leica Elmarit 24 mm f/2.8 ASPH lens with an effective 35-mm-equivalent focal length of 36 millimeters is the standard in photojournalism and the X2 is well positioned to take photographs that will stand the test of time and technology.With the Leica X2and its 2.7″ LCD with 230,000 pixels and a 100% field of vision, you won’t miss a single shot. The ease of transitioning between automatic and manual settings and the Leica’s ergonomic frame allows the user to concentrate on composition rather than fumbling with settings and buttons. Adjusting shutter speed and aperture is a breeze and it is simple to change the plane of focus, white balance and other imaging parameters. The X2 also has a pop-up flash and full compatibility with external Leica flash units, ideal for low light and other challenging lighting situations. 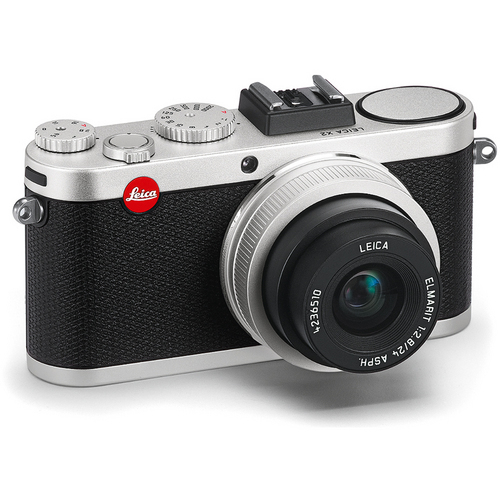 The Leica X2 epitomizes the classic design and styling recognized by camera lovers all over the world. You can choose a striking black or classy silver finish. The LEICA X2 is currently available at fine camera retailers like 42nd Street Photo in New York City.